Last year, while lounging on the beach in the Caribbean…oops, I mean while doing off-site research, I developed the first iteration of a rule to describe how fiscal policy should operate. My motivation was to help people understand that America’s fiscal problem is excessive government spending, not red ink. Deficits and debt are undesirable, of course, but they are best understood as symptoms. The underlying disease is a bloated federal budget that diverts resources from the productive sector of the economy and subsidizes dependency. The purpose of this rule isn’t to make me famous, like Art Laffer with the Laffer Curve. Instead, I’m hoping that this simple construct will help policymakers focus on the most important variable. Countries that follow the Golden Rule, such as Hong Kong and Singapore, enjoy long-run prosperity. But the Golden Rule also shows how nations in fiscal trouble can get back on the right track with periods of spending restraint, as shown in this video featuring Canada, Slovakia, New Zealand, and Ireland. And this video shows how the United States made progress during both the Reagan years and the Clinton years. Governments that take the opposite approach, however, eventually wind up in fiscal chaos. Just look at the data from Greece. Or other crumbling welfare states. 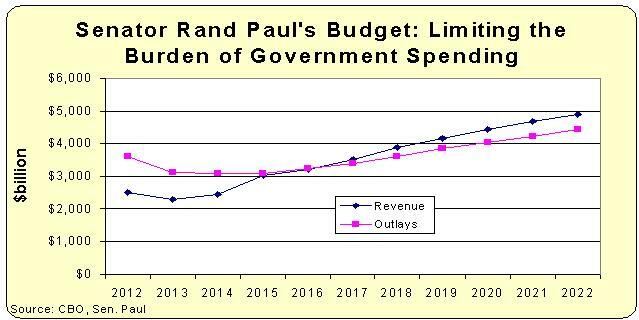 All this discussion about how to measure good fiscal policy may seem esoteric, but it provides the foundation to understand why Senator Rand Paul’s new budget proposal is so admirable. Joined by Senators Jim DeMint and Mike Lee, Senator Paul has a comprehensive proposal to curtail big government. 1. An immediate cut of $500 billion of wasteful spending. 2. A five-year freeze on total government spending. 3. Limiting average annual spending growth to 2.2 percent over the next ten years. Last but not least, taxpayers get a big reward from Senator Paul’s budget with a simple and fair 17 percent flat tax. 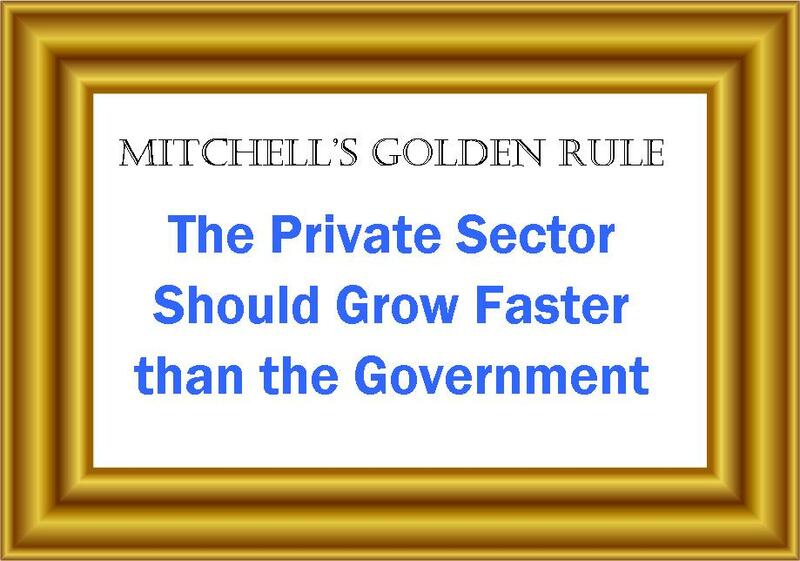 This pro-growth policy is desperately needed to boost the economy and improve competitiveness. And while a flat tax theoretically could be enacted without accompanying spending restraint, it’s far more likely to happen if lawmakers show they’re serious about restraining the federal behemoth. The accompany chart shows the 10-year projections for spending and revenue if Senator Paul’s budget is enacted. A few additional thoughts. Senator Paul and his colleagues are highlighting the fact that the plan generates a balanced budget in just five years. That’s a good outcome, but it should be a secondary selling point. All the good results in the plan – including the reduction in red ink and the flat tax – are made possible because the overall burden of federal spending is lowered. That should be the main selling point. This doesn’t mean that Senator Paul is in any danger of winning a Bob Dole Award, but it’s nonetheless unfortunate since a focus on deficits gives an opening for leftists to claim that they can achieve the same outcome with tax increases. This is why sponsors should focus on the importance of spending restraint, and then add explanations of how this eliminates red ink. This is the approach I took in this video showing how limits on the growth of spending would lead to a balanced budget. Also, I have two minor disagreements with Senator Paul’s budget proposal. 1. He does not modernize Social Security system with personal retirement accounts. He does have reforms to rein in the program’s long-run outlays, thus addressing the system’s fiscal crisis. But this generally means workers will pay more and get less, thus exacerbating the system’s other crisis, which is the anemic ratio of benefits received compared to taxes paid. 2. He retains the home mortgage interest deduction in the flat tax plan. This may sound like nit-picking since I should be happy to get 99 percent of what I want, but I worry that allowing one deduction will pave the way for more deductions. Remember the old advertisement by Lay’s potato chips (at least I think) with the saying that “I bet you can’t eat just one”? Well, that’s how politicians would be with a flat tax. Once they allowed one horse out of the barn (I realize I’m mixing my metaphors here, but you get the point), it would be just a matter of time before the entire herd escaped. But I’m not here to make the perfect the enemy of the very, very good. I wrote a lot last year about the Ryan budget, which was quite an achievement (particularly since it actually passed the House). The Paul budget is the Ryan budget, but even better. zb – how can you possibly claim that a flat tax wouldn’t reduce the size of the IRS? That makes no logical sense. Also, how can you possibly claim that the economy wouldn’t rebound, increasing revenue, if we were able to eliminate 90% of the completely non-productive administrative roles associated with tax compliance? If even half of the costs associated with tax compliance could be used by R&D and process improvements, the efficiency and output of US companies would be greatly increased. You try to poke holes in Rand Paul’s plan, which is 10x better than any other other plan currently proposed (except perhaps the “Plan to Restore America” created by his dad) but you don’t offer any alternatives. What tax model would you shoot for? I’m a fair-tax proponent myself, but I think a flat tax has a better chance of being accepted than the fair-tax. Eitan – Could the reason they go nowhere is that spenders still control the Senate? If you’d like them to go somewhere, perhaps consider getting you and your friends to vote for a Senator and Congressperson who would support such legislation? I like Rand Paul but I’ve noticed he comes out with all these good bills that go nowhere. Does this one have a chance of becoming law? This is a joke, right? He assumes that the economy will somehow miraculously rebound that it will produce the remaining 1 trillion bucks of annual revenue to balance the budget? It’s a fantasy. It won’t happen. Paul is merely repeating and rehashing the rosy budget blueprint that he introduced last year. It would never balance the budget. By contrast, the budget plans of the Republican Study Committee and the Heritage Foundation WOULD balance the budget, albeit in a decade. His flat tax proposal is a nonstarter and shows why he is not serious about tax reform. The biggest problem with the income tax is not that it is progressive, and not even the fact that it contains many tax loopholes. The biggest problem is that it is an INCOME TAX – a tax that confiscates people’s hard-earned earnings. A tax that punishes productivity and savings instead of incentivizing them. An INCOME TAX always is, and always will be, a huge drag on the economy, whether it is flat or not. Moreover, a flat income tax will also not solve other big problems with the INCOME TAX – the bloated, oppressive IRS; the intrusive IRS audits; the burden of filling out tax returns every year, and so forth. A flat tax is not a solution at all. It is a mere placebo. Besides, the flat tax is such a joke that it wouldn’t stay flat for very long. It could be made progressive (i.e. new tax brackets could be added) by the next Congress. It would take only one or two Congresses to undo everything that the flat tax could give us. Don’t believe me? Recall that the CURRENT abomination of a federal tax code started in 1913 as a flat income tax. Yet, by 1917, it was a progressive income tax whose highest rate was 77% – a rate not even the most fervent advocate of the federal income tax dreamed of in 1913. The flat tax is not a solution, mere a placebo, and should not even be considered. Sadly, too many flat tax supporters, including Rand Paul, are wedded to their precious flat tax idol, so they are not willing to consider anything else. By far the most difficult aspect of converting people to the cause of real tax reform has been to get them to at least CONSIDER an option other than a federal income tax. Once that is done, however, it’s easy to do the rest of the “convincing” task.